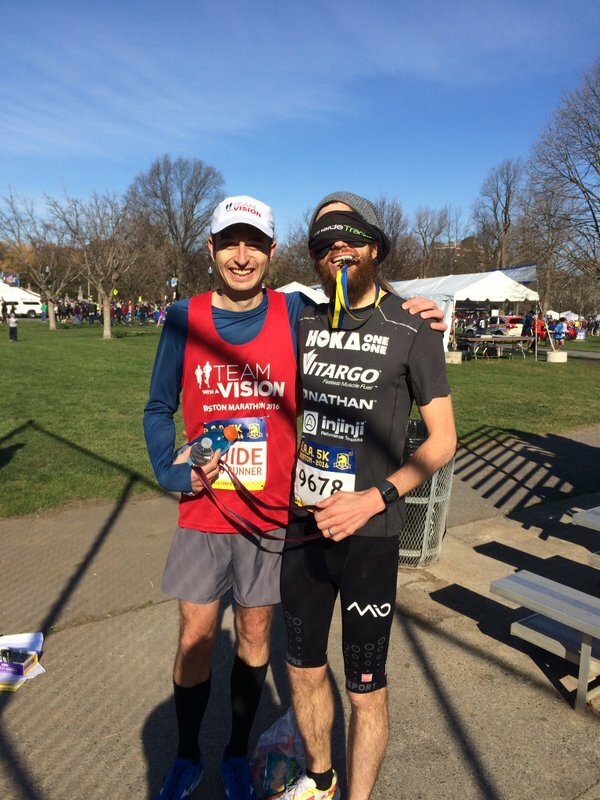 I had heard about the Blindfold Challenge when a buddy and fellow Ultrarunner named Kyle Rodiboux, who also works for MABVI, asked me to run it. I said “Sure!” We talked a bit about how it would work, who my guide would be (it turned out to be Chad Carr, who is a stud and a cool guy – thank you Chad!) and what I was expected to do. Kyle and the entire team at MABVI and their Team With A Vision were first-class and utterly professional. I felt immediately confident in them and in my guide Chad. The weekend started with a shakeout run for InsideTracker and Sweetgreen, a few of my sponsors, with a group of friends and athletes. Chad and I decided to use this as a practice run so I could get used to him guiding me. It was my first time ever running blindfolded, so I felt very vulnerable, exposed, and dependent, but at the same time, stoked, elated, jazzed, and pumped! Overall, though, I was scared. I was scared of tripping, scared of running into a pole (which I had done on my bike two years ago, and it hurts! ), scared of twisting an ankle, scared of not understanding the commands from Chad, scared of getting hurt and then jeopardizing my big goal of 2016 (to set the fastest combined time in all the world marathon majors), scared of failing and letting down everyone…. The shakeout started and I felt like I was basically walking or doing a high step drill, which wasn’t good enough for me – I had to be “running” 15 minute miles. Chad was great guiding me, talking me through the run, getting me more and more confident and in control, and by the time we hit the waterfront, we were actually running. Not so fast but definitely faster than at the start and by the end, my fears were easing and I knew we could race in the B.A.A. 5k. I kept the blindfold on for the post-run activities and it was so interesting to be in a crowd and be hyper aware of the smells and sounds around me. I feel like I do a good job being present most of the time, but without sight it is not a choice. You are present always, or at least that is how I felt. I was trying to take in and process as much as possible so I could still be involved in the group and not feel marginalized. It was awesome and powerful and I loved it, but I could also understand how it would be tough in a group of strangers or if I was not someone most people knew in the group. I went home after the run and was able to get a good night’s sleep. I woke up early, got dressed, and made my way to the starting line to meet Chad and the other athletes. The Blindfold Challenge happens at the B.A.A. 5k, only two days before I would run the Boston Marathon. 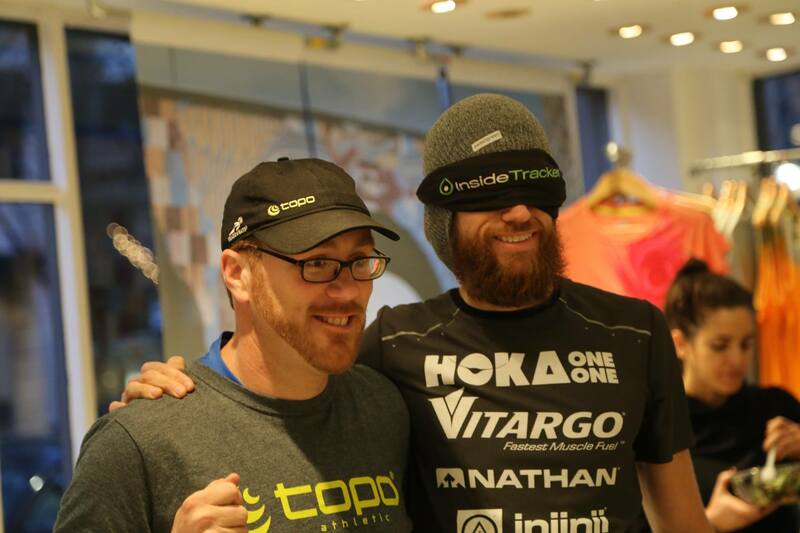 I would be racing alongside the other 10,000 runners in the field – except blindfolded, and with Chad guiding me. After a bit of palling around, Chad and I got ready, I put on my blindfold and we went for a warm up. I was already 20 times more confident about me being able to race as I trusted Chad and knew we could throw down. Unfortunately, we messed up a bit when we didn’t get to the start in time to be in the front, so for the first 1.5 miles we had to pass packs of people, which is a challenge as a sighted athlete but really cumbersome for someone without sight. After about 2 miles, Chad and found our pace and put down a sub-6 mile, passing a huge amount of people to finish in 20:34, which is not bad as our first mile was 9:08. I felt like we were flying at the end and it was so cool to have people yelling for us the entire race. I know that if Chad and I had a few more runs together, made it to the front, and were able to push, we could finish in about 16 to 16-and-a-half minutes or so for the 5k, and I would like to make that a goal for the future. At the end of the Blindfold Challenge at the B.A.A. 5k I felt confident, powerful and resilient, and I can really understand now how sports, and in particular running, are super powerful for raising your self-confidence and self-worth. What a change from only 12 hours before! I did two runs of less than two hours total, and those runs, along with the support from Team With A Vision and the Massachusetts Association for the Blind and Visually Impaired, changed me from timid and fearful to powerful and determined. I know that I am so fortunate to have the choice to be sighted or not sighted and I appreciate that I have the opportunity to briefly run in someone else’s shoes. The Blindfold Challenge gave me an amazing appreciation for what feats athletes who are visually impaired are accomplishing both on and off the course. I feel like a part of this incredible community and hope to be a part of these experiences in the future. Thank you to everyone involved and especially Chad for guiding me and Kyle for reaching out. I hope to take part again and continue to raise awareness for MABVI, Team With A Vision, and all the awesome things that are happening in this community. 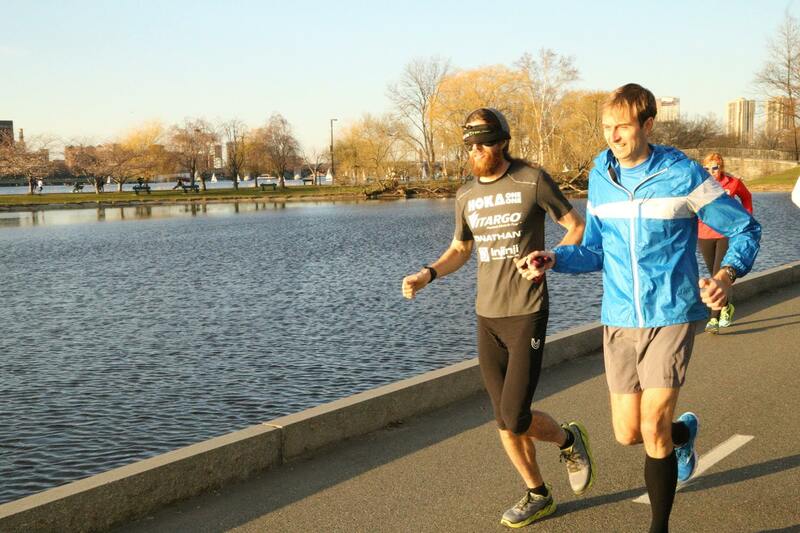 Michael Wardian is an accomplished American marathoner and ultra-marathoner. 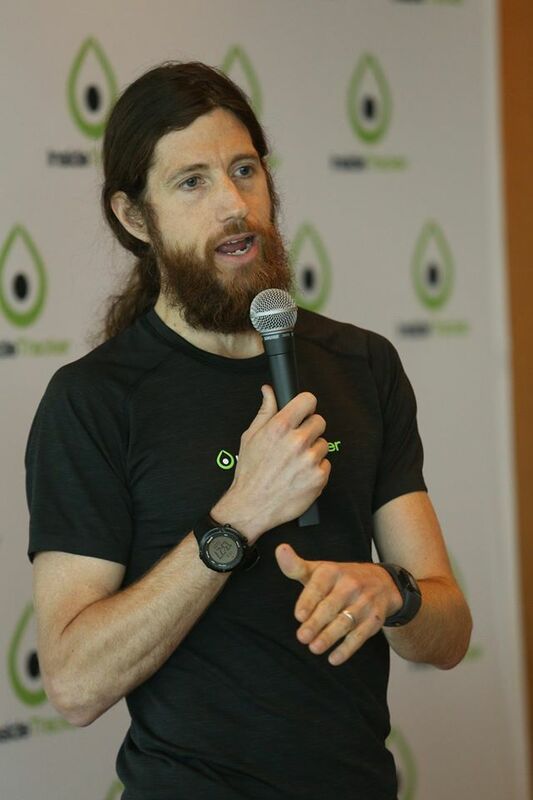 Wardian was named the IAU Ultra Runner of the Year in 2010, and is a four-time USATF Ultra Runner of the Year from 2008-2011. He also won the 2014 USATF Master’s Athlete of the Year for both Roads and Trails. In addition to a lengthy list of podium finishes at marathons, half-marathons, 50k/100k and 100 Mile races, Michael has set World Records for the fastest marathon and also 50K on an indoor 200-meter track, and in March 2015, he also set the World Record for the fastest 50K on a treadmill. In between feats such as running two marathons in one day, and setting a world record for the fastest time running a marathon dressed as superhero, Wardian has participated in the 2004, 2008, and 2012 U.S. Olympic Trials Men’s Marathon, recording a personal best of 2:17:49. He has competed in some of the world’s most difficult races, such as the Marathon des Sables in the Sahara Desert and the USA North Pole Marathon. 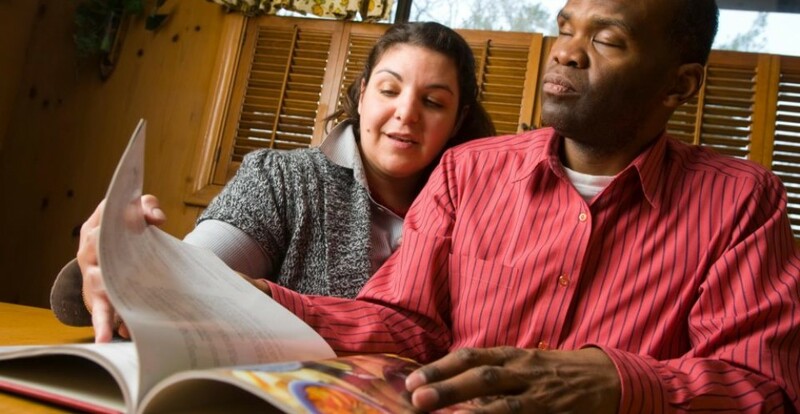 Michael resides in Arlington, VA with his wife and two sons, Pierce and Grant. This entry was posted in Running, Uncategorized and tagged BAA 5k, blind, Blindfold Challenge, Blindness, Boston, Boston Marathon, Chad Carr, InsideTracker, kyle robidoux, MABVI, massachusetts association for the blind and visually impaired, Michael Wardian, Mike Wardian, running, sweetgreen, Team With A Vision, TWAV, Visual impairment, Visually Impaired by mabvi. Bookmark the permalink.